For Kris Keller, design is more than just a career; it's her professional raison d'être. 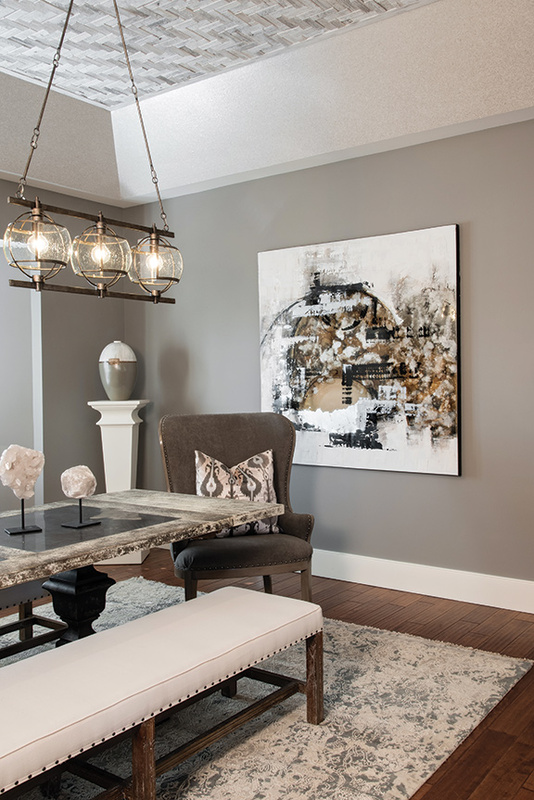 Per the owners’ request for a “less formal” dining room, Keller created a sophisticated, organic décor – with a touch of shimmer. Installed in a herringbone pattern, reclaimed lumber tops the ceiling, and mica wallpaper lines the coffer’s side walls. 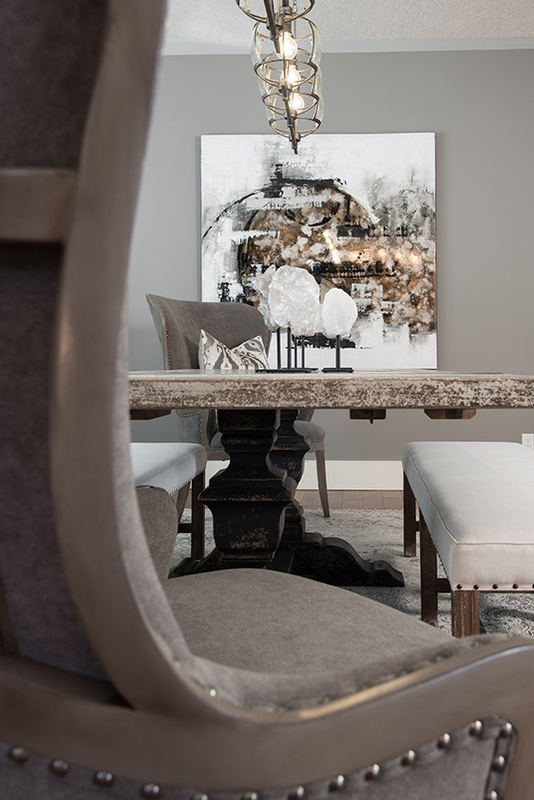 The aged-wood trestle table is inset with soapstone, and decorative geodes add sparkle. Lantern-style Cutter & Company lighting fixtures span the dining table, surrounded by banquettes and deconstructed host wing chairs. 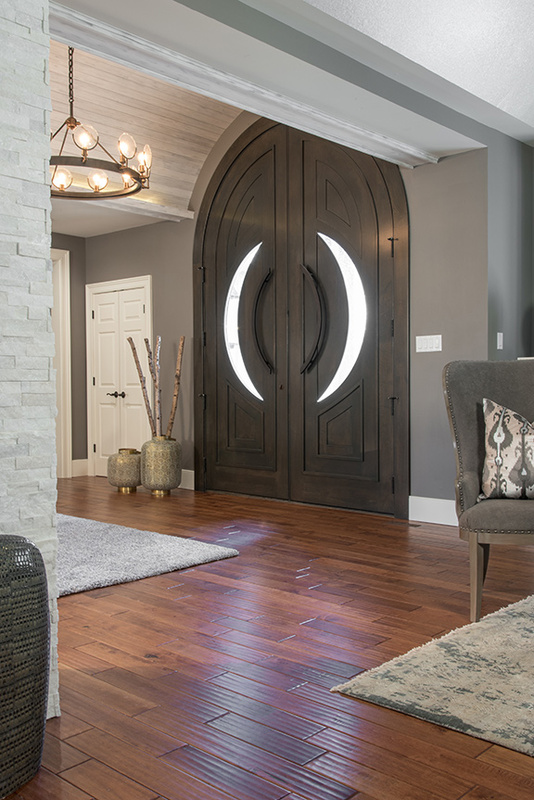 Completely redesigned, the entry features a barrel vault with an antique tongue-and-groove ceiling and LED lighting. A stylish custom balustrade opened the staircase to the lower level, and the massive support column was faced in sparkling white stone. The spectacular entry door was custom-crafted in rift-sawn white oak by The Scobis Company from Keller’s design. 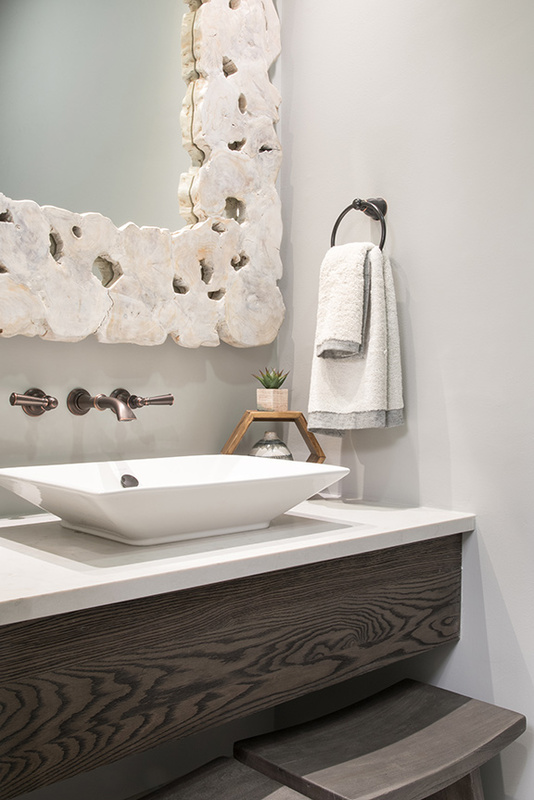 A sculptural mirror from Made Goods complements the powder room’s Karr Bick vanity and rectangular Kohler sink. Gleaming white marble cocktail and end tables from Curated Kravet accent the soft blues and grays of the living room. The abstract painting and accessories are from Erdos at Home. Emphasized with a unique ruffled mirror, the living room’s original fireplace was retained and became the basis for the Mid-Century décor. 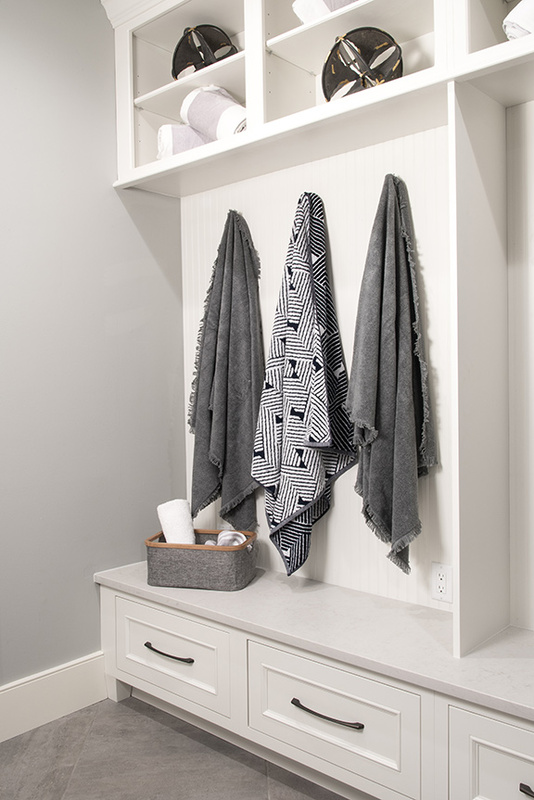 Converted to a more functional multi-purpose space, the laundry/pool changing room showcases custom cabinetry and a storage wall by Karr Bick. 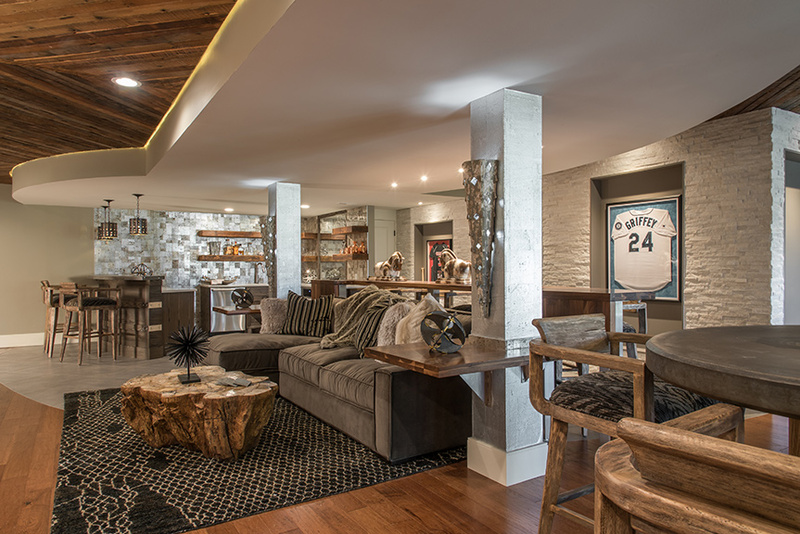 Fully “tricked out,” the lower-level entertainment area is the ultimate man cave. The soffit’s curved lines are repeated in the flooring, crescent-shaped bar, and the open, 14-foot bar counter backing the lounge area. Metallic porcelain wall tiles, silver cork-wrapped support columns, and Cyan Design sconces reinforce the home’s “shimmer” theme. Kris Keller entered the design industry 33 years ago and founded her own firm, The Design Source, eight years later. She readily admits, “At first it was a job, then a career and now it’s my avocation. I feel we’re giving back to the world, supporting the well-being of the people whose lives we’ve touched.” And this 1980s-vintage reverse ranch in Creve Coeur is a prime example of how she interprets that philosophy. Although a bit complicated, the back story to this project is rather intriguing. 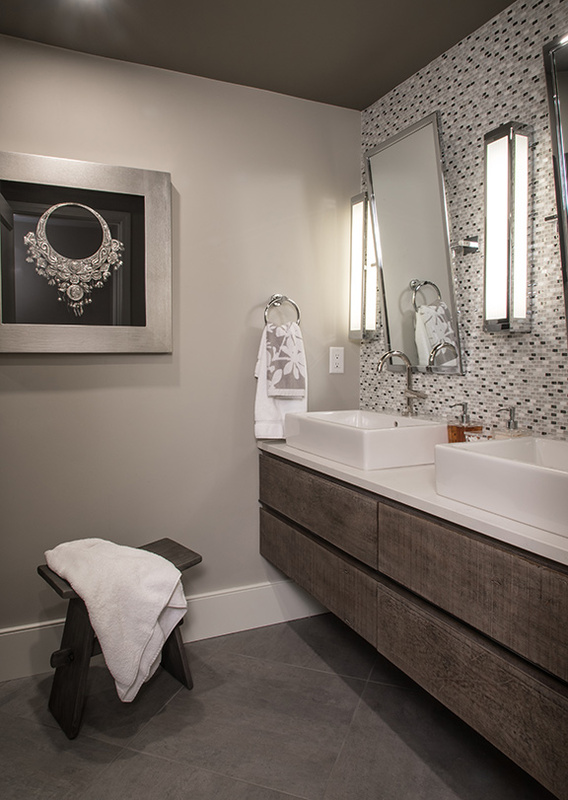 Kris had been working with a local custom builder on a spec home in the same upscale neighborhood. The ranch’s previous owner was out walking one day, saw the spec home and ultimately decided to buy it. Meanwhile, a young couple – the husband a St. Louis sports figure – were home-shopping in the area and had fallen in love with the same house, which was now sold. Turning disappointment into serendipity, the couple purchased the 30-year-old, 5-bedroom ranch from its former owner and engaged Kris to handle the renovation. The ranch’s kitchen had been remodeled recently, and Kris liked its Old-World aesthetic. 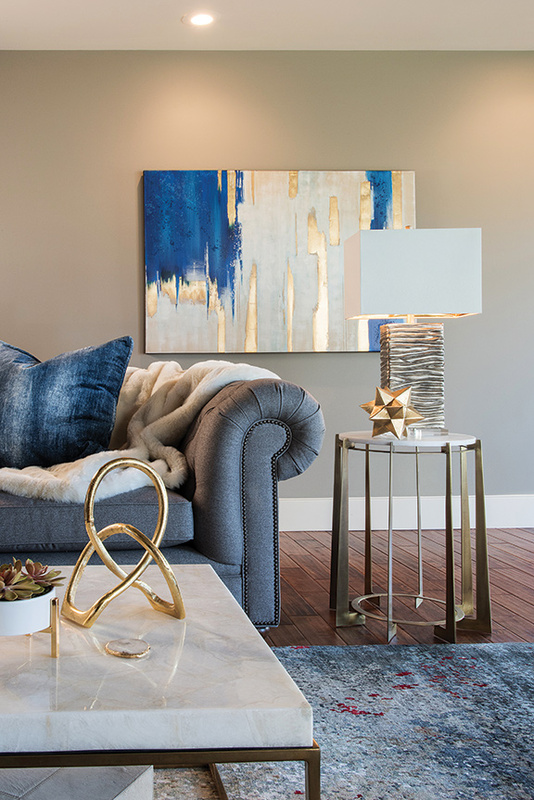 Using this finished space to generate her overall design, she “layered” the rest of the traditionally styled residence to conform to her clients’ more contemporary taste and lifestyle. Starting with the exterior, the wood and brick were painted and recolored for a lighter, more modern effect, and the outdoor living area was completely resurfaced. Collaborating with Jim Bulejski Architects, Keller’s next step was to open the spaces and sight lines throughout the main-floor activity areas. 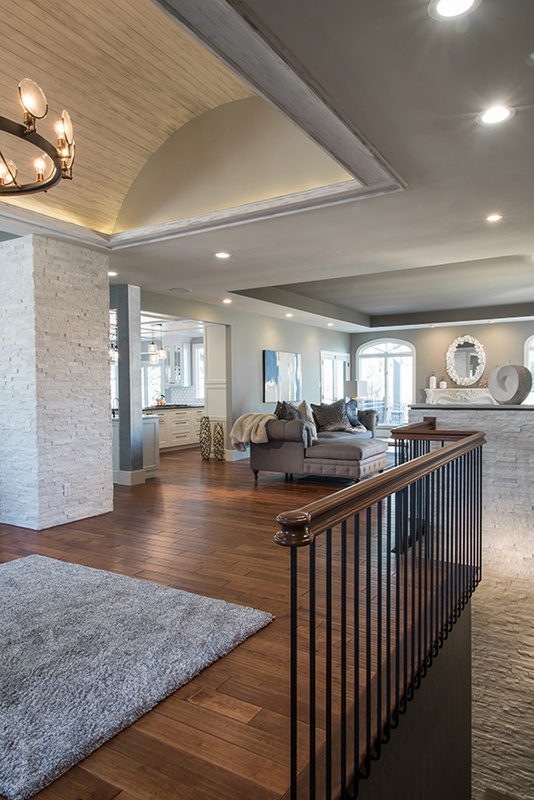 Walls and columns were removed; the kitchen was opened to the dining room and the hand-scraped hickory plank flooring extended; and the entry and staircase to the lower level were completely redesigned. Now barrel-vaulted and LED-lighted, the foyer’s reclaimed antique tongue-and-groove ceiling is reminiscent of the kitchen ceiling and appointed with a forged-iron, gaslight lens chandelier from Restoration Hardware. Filling the arch is a magnificent 12-foot, rift-sawn white oak entry door, fabricated by The Scobis Company from Keller’s Asian-inspired design. To update the staircase, the original balustrade was replaced with a stylish custom treatment by Classic Metal Craft. Taken down to its “bare bones,” the tray-ceilinged living room was stripped of decorative architectural onlays and moldings. The ornate fireplace, however, was retained and became the basis for the room’s new Mid-Century décor, accentuated by a unique “ruffled” mirror above the mantel. Soft blue and gray furnishings, marble cocktail and end tables from Curated Kravet, and a basket weave entertainment center and contoured marble accent table from Global Views create a fresh, youthful ambience. 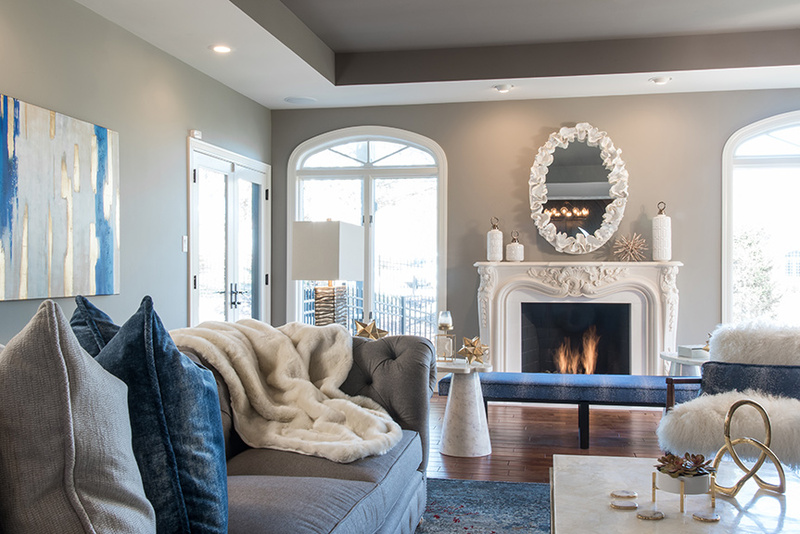 And for a comfy “pop of wow,” Kris added furry white chairs from Arhaus. The designer’s innovative styling is particularly evident in the dining room, where the coffered ceiling is topped with reclaimed lumber installed in a herringbone pattern, and the coffer’s side walls are lined in shimmery mica wallpaper. Inset with soapstone, the aged-wood trestle table is set on a textured damask rug and bracketed by exposed-back host chairs upholstered in velvet, all from Arhaus. 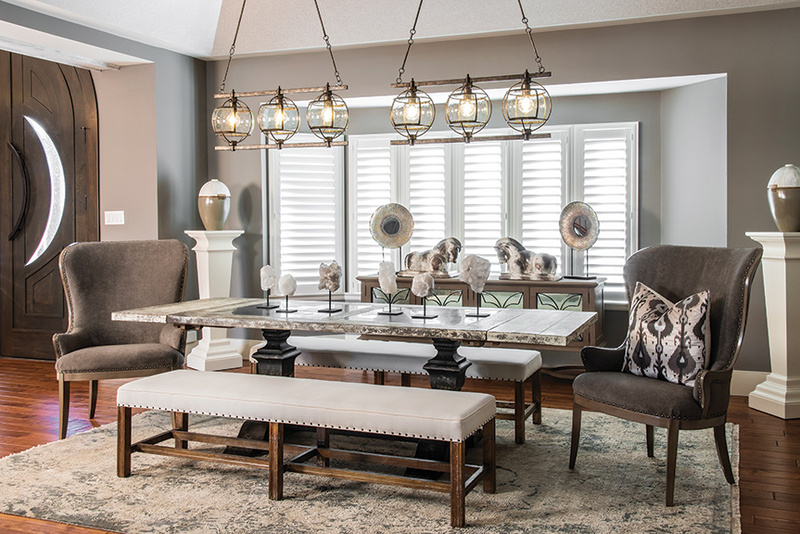 Two lantern-style Currey & Company lighting fixtures span the table and, responding to her clients’ request for a less formal dining space, Kris chose banquettes from Noir in Los Angeles as an alternative to dining chairs. Also hand-crafted by Noir, the buffet features aged mirror doors trimmed in metal, and an arrangement of decorative geodes lining the table subtly repeats the coffer’s sparkle. 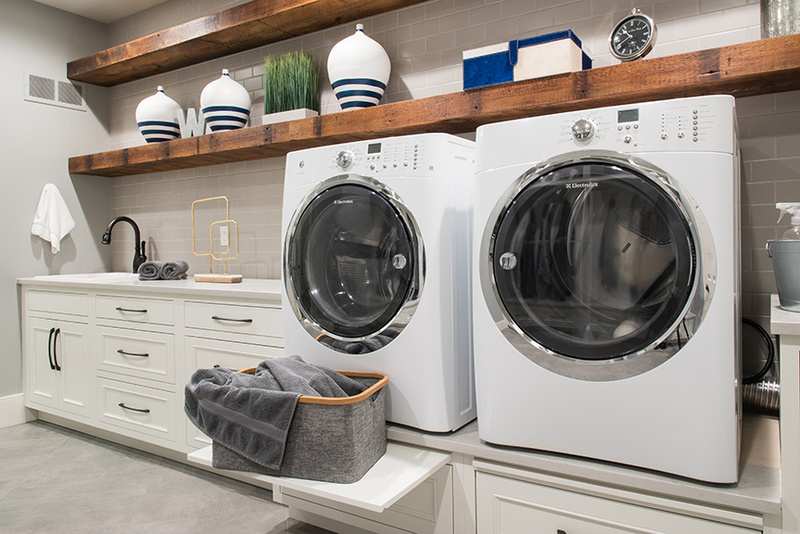 Similar creativity was applied to the laundry room, which had little functionality for the ranch’s new owners and was converted to a combination laundry/pool changing room with an adjacent powder room. Oversize porcelain tiles resembling organic concrete provide durable, water-resistant flooring. Karr Bick had installed the custom cabinetry for the remodeled kitchen and was called back to fabricate the laundry’s storage wall and Caesarstone-surfaced cabinetry. Pull-out trays under the raised washer/dryer add convenient work space, and massive wood display shelves from Reclaim Renew lend warmth and character to the multi-purpose room. The ultimate man cave, the spacious lower-level entertainment area is fully “tricked out,” per the husband’s instructions. He selected the pool table, but the rest was left to Kris, who decided to transform the space into an “explosion of the dining room elements.” Reclaimed wood in a herringbone pattern blankets the ceiling. A curved soffit adds visual interest, and the curve is repeated in the flooring, partially tiled in porcelain with the remainder in an engineered version of the hickory planks upstairs. Shimmering white stone covers the predominant wall, which showcases display niches for the owner’s sports memorabilia. 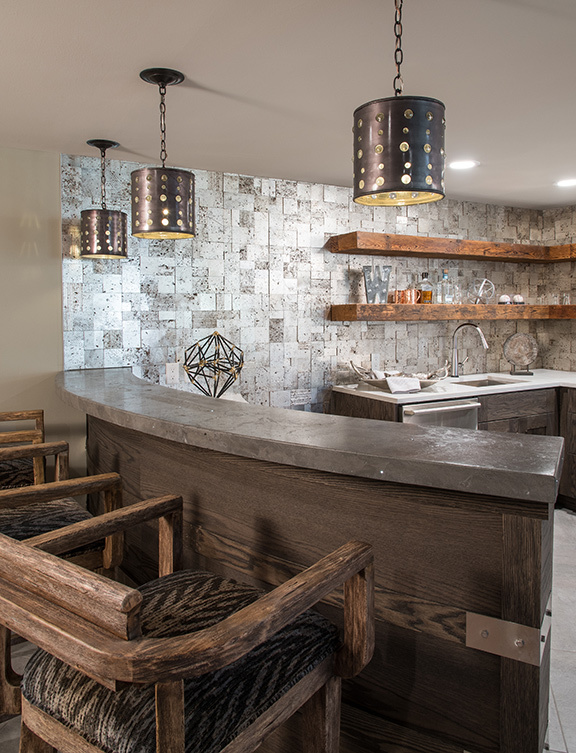 Pewter-metallic cork wallcovering wraps the support columns, reflecting the metallic Anne Sacks wall tiles behind the fully equipped wet bar. Ruggedly masculine, a petrified wood coffee table is positioned in front of a comfortable lounge from Erdos. The lounge faces a media console and backs to a curved, 15-foot floating walnut bar top, sourced from Freedom Products. Set on stainless legs rather than a heavy knee wall, the expansive bar top allows for considerable beverage/conversation seating, while preserving the room’s sense of openness. The serving area is furnished with rustic Karr Bick cabinetry, and the emphasis on curved contours is repeated in the crescent-shaped island bar. Created by TruCrete, the bar is surfaced in weathered concrete and cleverly embedded with LED lighting. Overhead, perforated metal pendant lights replicate the star-like effect. In the billiard area, the washed-brick fireplace is framed in reclaimed wood, and scattered throughout this entertainment mecca are 17 weathered oak bar chairs from Uttermost and a concrete-topped pedestal table for plenty of additional guest seating. Catering to the athlete-owner’s special regimen, authentic barn doors lead to a well-outfitted exercise room, and a fabulous steam shower is also located on this level.